If you like living large on the go, go Commando with this rove® 40 Ounce Stainless Steel Hydration Bottle that’s big on capacity, performance, convenience and style. The rove® Commando 40 ounce Hydration Bottle is perfect for active people who need to stay hydrated with less refills throughout the day. 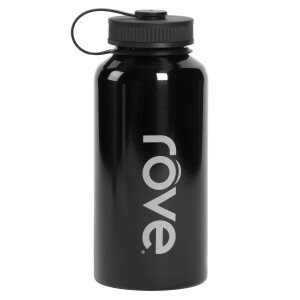 Constructed of ultra-durable stainless steel, this large capacity water bottle is designed to keep you hydrated and last for a long time – ideal for workouts and other activities. Commando is loaded with convenience features, like an easy-grip leak-proof lid, wide mouth, and carrying hook. It’s big on style, with a bold design and lustrous exterior.